He was a student of the Basho school. walking in the thicket . . .
dew from the arrow bamboo . . . Written in the summer of 1693 元禄6年夏. At the home of Miyazaki Sensen 宮崎荊口 - 千川. Sensen had been the representative of the Shogun to visit Nikko in that year. On his hakama there was certainly some dew from the bamboo of Nikko. This ku shows Basho's appreciation of his haikai friend Sensen. sasa - shinodake 篠竹 is a special slender type of bamboo, also called Hokodake 鉾竹.
. WKD : shinodake 篠竹 . This hokku is one more hokku mistakenly attributed to Issa in the Complete Works of 1979 (1:621). Chekcing the source of the Wiki article -- the Issa hokku sou-sakuin, or General Index of Issa's Hokku published in 1994 by the Shinano Mainichi Newspaper Co. This index first carried (on p. 4) the list of the 46 hokku that are actually by Toen 兎圍. On the same page it also lists another hokku in Issa's Complete Works (1:621) that is not by Issa but by the haijin Keikou (荊口, d. 1725), and since the hokku been translated into English as Issa's hokku, I think the actual author needs to be pointed out. 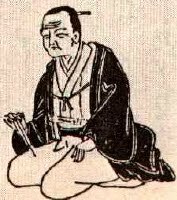 Keikou (Thorn/Sharp Mouth) was a follower of Basho and a samurai who lived in Mino, a mountainous area northeast of Kyoto just inland from the Japan Sea. Basho visited the area and his meeting with Keikou appears at the end of Narrow Path to the Interior. Keikou's hokku about the tall cedars appears in the Ariso-umi (Wild Rocky Shore) anthology of 1695 as the first hokku in the winter hokku section (Koten hai-bungaku taikei 7:89), so it must have been a fairly famous hokku. Perhaps Toen liked it and kept it with his own hokku, which Issa then copied down, or perhaps Issa just liked it and jotted it down, and it got mixed in with other manuscripts. This winter hokku is a nice read in summer. Many Japanese cypress trees (Cryptomeria japonica) grow to be more than 200 feet tall, and the bottom two-thirds of the trunks often have no limbs, making them look even slimmer and taller. They were widely grown for lumber and for protecting hillsides against erosion in the premodern period, and Keikou says that some of the cedars in his hometown of Oogaki in Mino are of the tallest type. Their height stands out even more in winter, when their green needles contrast with the leafless limbs of the deciduous trees. The first hard winter rain shower is now coming down, and the thin, slanting lines of the rain also contrast with the trees, a contrast made stronger by way the cedars stand straight and seem to soar upward while the rain falls. The vertically rising strength of the land in Keiko's hometown meets the descending power of the rain, suggesting of an energetic dialog between earth and sky in which the reader/viewer is in the middle and pulled in both directions at once.
. Kubota Toen 久保田兎圍 .